27 January is International Holocaust Remembrance Day, an international memorial day in remembrance of victims of the Holocaust, the genocide that resulted in the annihilation of 6 million Jews, 2 million Gypsies (Roma and Sinti), 15,000 homosexual people and millions of others by the Nazi regime and its collaborators. It was designated by the United Nations General Assembly resolution 60/7 on 1 November 2005 during the 42nd plenary session. the resolution came after a special session was held earlier that year on 24 January 2005 during which the United Nations General Assembly marked the 60th anniversary of the liberation of the Nazi concentration camps and the end of the Holocaust. The date 27 January was chosen to in remembrance of 27 January 1945, when the largest Nazi death camp, Auschwitz-Birkenau, was liberated bySoviet troops. Prior to the 60/7 resolution, there had been national days of commemoration, such as Germany’s Tag des Gedenkens an die Opfer des Nationalsozialismus (The Day of remembrance for the victims of National Socialism), established in a proclamation issued by Federal President Roman Herzog on 3 January 1996; and the Holocaust memorial day observed every 27 January since 2001 in the UK. The Holocaust Remembrance Day is a national event in the United Kingdom and inItaly. Nick Mason the drummer from Prgressive Rock band Pink Floyd was born 27 January 1944. Pink Floyd were founded in 1965 and originally consisted of students Roger Waters, Nick Mason,Richard Wright, and Syd Barrett. They first became popular playing in London’s underground music scene in the late 1960s. Under Barrett’s leadership they released two charting singles, “Arnold Layne” and “See Emily Play”, and a successful début album, The Piper at the Gates of Dawn .In 1968 Syd Barratt departed from the group due to his deteriorating mental health & Gilmour joined Pink Floyd as the fifth member several months prior to this. Following the loss of their principal songwriter, Pink Floyd bassist and vocalist Roger Waters became the band’s lyricist and conceptual leader, with Gilmour assuming lead guitar, taking on most of the band’s music composition, and sharing lead vocals. With this line-up Pink Floyd achieved worldwide critical and commercial success with their progressive and psychedelic rock music, which used philosophical lyrics, sonic experimentation, innovative album art, and elaborate live shows. and release of many concept albums such as The Dark Side of the Moon, Wish You Were Here, Animals and The Wall. Pink Floyd ranked number 51 on Rolling Stone magazine’s list of “The 100 Greatest Artists of All Time”, with David Gilmour ranking 14th in the greatest guitarists list. Largely due to the success of their albums the band was ranked No. 3 in Colin Larkin’s the ‘Top 50 Artists Of All Time’. 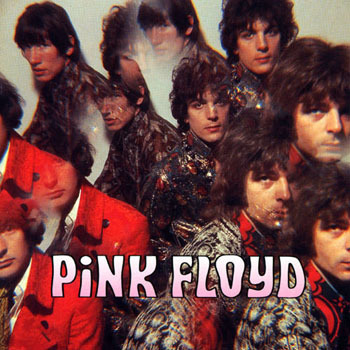 Numerous artists have been influenced by Pink Floyd’s work: David Bowie has called Syd Barrett a major inspiration, The Edge (U2) also bought his first delay pedal after hearing the opening to Animals; and the Pet Shop Boys paid homage to The Wall during a performance in Boston; Marillion guitarist Steve Rothery has also cited Wish You Were Here as a major inspiration; and many other bands, including the Foo Fighters, Dream Theater, My Chemical Romance, Porcupine Tree, The Mars Volta, The La’s, Queen, Oasis, Iron Maiden, Stone Temple Pilots, Coheed and Cambria, Tool, Queensryche, 30 Seconds to Mars, Scissor Sisters, Rush, Radiohead, Gorillaz, Mudvayne, Nine Inch Nails, Korn, Primus and the Smashing Pumpkins, have all been influenced by them.Pink Floyd have also been nominated for and won multiple technical awards including “Best Engineered Non-Classical Album” Grammy in 1980 for The Wall and BAFTAs award for ‘Best Original Song’ (awarded to Waters) and ‘Best Sound’ in 1982 for the The Wall film. A Grammy came to them in 1995 for “Rock Instrumental Performance” on “Marooned”. In 2008 Pink Floyd were awarded the Polar Music Prize for their contribution to contemporary music; Waters and Mason accepted the prize from King Carl XVI Gustaf of Sweden. They were inducted into the Rock and Roll Hall of Fame on 17 January 1996, the UK Music Hall of Fame on 16 November 2005 and the Hit Parade Hall of Fame in 2010, and were also inducted into the Rock and Roll Hall of Fame in 1996. They have continued to enjoy worldwide success and are one of the most commercially successful and influential rock music groups of all time. After the untimely demise of Curtis in 1980, the remaining members formed New Order, with Bernard Sumner on vocals, guitars, synthesisers), Peter Hook playing bass, synthesisers and Stephen Morris playing drums, electronic drums, synthesisers, they were also joined by Gillian Gilbert playing keyboards, guitars, synthesizers. By combining post-punk and New Wave with electronic dance music, New Order became one of the most critically acclaimed and influential bands of the 1980s. Though the band’s early years were shadowed by the legacy and basic sound of Joy Division, their experience of the early 1980s New York City club scene increased their knowledge of dance music and saw them incorporate elements of that style into their work. The band’s 1983 hit Blue Monday”, the best-selling 12-inch single of all time, is one example of how the band transformed their sound. 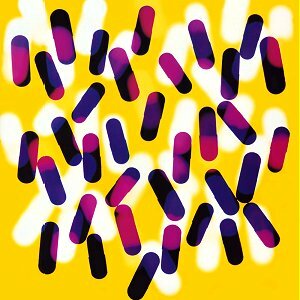 Thanks to fantastic albums like SUBSTANCE and TECHNIQUE New Order became the flagship band for Factory Records. Their minimalist album sleeves and “non-image” (the band rarely gave interviews and were known for performing short concert sets with no encores) reflected the label’s aesthetic of doing whatever the relevant parties wanted to do, including an aversion to including singles as album tracks.Sadly In 1993 the band broke-up amidst tension between bandmembers, but reformed in 1998. In 2001, Phil Cunningham (guitars, synthesisers) replaced Gilbert, who left the group due to family commitments. In 2007, Peter Hook left the band and the band broke-up again, with Sumner saying in 2009 that he no longer wishes to make music as New Order. The band reunited in 2011 without Hook, with Gilbert returning to the fold and Tom Chapman replacing Hook on bass. During the band’s career and in between lengthy breaks, band members have been involved in several solo projects, such as Sumner’s Electronic and Bad Lieutenant; Hook’s Monaco and Revenge and Gilbert’s and Morris’ The Other Two. Best known as the Ex-lead singer of the metal/experimental rock band Faith No More, the American singer-songwriter, multi-instrumentalist, producer, and actor, Michael Allan “Mike” Patton was born on this day January 27 in 1968. Known for his eclectic influences and experimental projects, Patton has earned critical praise for his diverse vocalization. Sadly though, Faith No More could not manage to match the commercial success of The Real Thing, & After three more studio albums (Angel Dust, King for a Day… Fool for a Lifetime, and Album of the Year) Faith No More officially disbanded in 1998. Since 19991 he has been running a record label named Ipecac Recordings, which He co-founded with Greg Werckman and has also sung for bands like Mr. Bungle (which preceded his involvement with FNM), Tomahawk, Fantômas, Lovage, The Dillinger Escape Plan and Peeping Tom, and also has many producer or co-producer credits with artists such as John Zorn, Sepultura, Melvins, Melt-Banana and Kool Keith. in 1856 he published his first piece of work under the name that would make him famous. A romantic poem called “Solitude” appeared in The Train under the authorship of “Lewis Carroll”. This pseudonym was a play on his real name; Lewis was the anglicised form of Ludovicus, which was the Latin for Lutwidge, and Carroll an Irish surname similar to the Latin name Carolus, from which comes the name Charles. The transition went as follows: “Charles Lutwidge” translated into Latin as “Carolus Ludovicus”. This was then translated back into English as “Carroll Lewis” and then reversed to make “Lewis Carroll”. In, 1856, a new dean, Henry Liddell, arrived at Christ Church, bringing with him his young family, all of whom would figure largely in Dodgson’s life and, over the following years, greatly influence his writing career. Dodgson became close friends with Liddell’s wife, Lorina, and their children, particularly the three sisters: Lorina, Edith and Alice Liddell. He was for many years widely assumed to have derived his own “Alice” from Alice Liddell. This was given some apparent substance by the fact the acrostic poem at the end of Through the Looking Glass spells out her name and also that there are many superficial references to her hidden in the text of both books. It has been noted that Dodgson himself repeatedly denied in later life that his “little heroine” was based on any real child, and frequently dedicated his works to girls of his acquaintance, adding their names in acrostic poems at the beginning of the text. Gertrude Chataway’s name appears in this form at the beginning of The Hunting of the Snark and it is not suggested that this means any of the characters in the narrative are based on her. Though information is scarce (Dodgson’s diaries for the years 1858–1862 are missing), it does seem clear that his friendship with the Liddell family was an important part of his life in the late 1850s and he grew into the habit of taking the children (first the boy, Harry, and later the three girls) on rowing trips accompanied by an adult friend.to nearby Nuneham Courtenay or Godstow.it was on one such expedition, on 4 July 1862, that Dodgson invented the outline of the story that eventually became his first and largest commercial success. Having told the story and been begged by Alice Liddell to write it down, Dodgson eventually (after much delay) presented her with a handwritten, illustrated manuscript entitled Alice’s Adventures Under Ground in November 1864 Before this, the family of friend and mentor George MacDonald read Dodgson’s incomplete manuscript, and the enthusiasm of the MacDonald children encouraged Dodgson to seek publication. In 1863, he had taken the unfinished manuscript to Macmillan the publisher, who liked it immediately. After the possible alternative titles Alice Among the Fairies and Alice’s Golden Hour were rejected, the work was finally published as Alice’s Adventures in Wonderland in 1865 under the Lewis Carroll pen-name, which Dodgson had first used some nine years earlier. The illustrations this time were by Sir John Tenniel; Dodgson evidently thought that a published book would need the skills of a professional artist. Dodgson invented many things including the Wonderland Postage-Stamp Case in 1889. This was a cloth-backed folder with twelve slots, two marked for inserting the then most commonly used penny stamp, and one each for the other current denominations to one shilling. 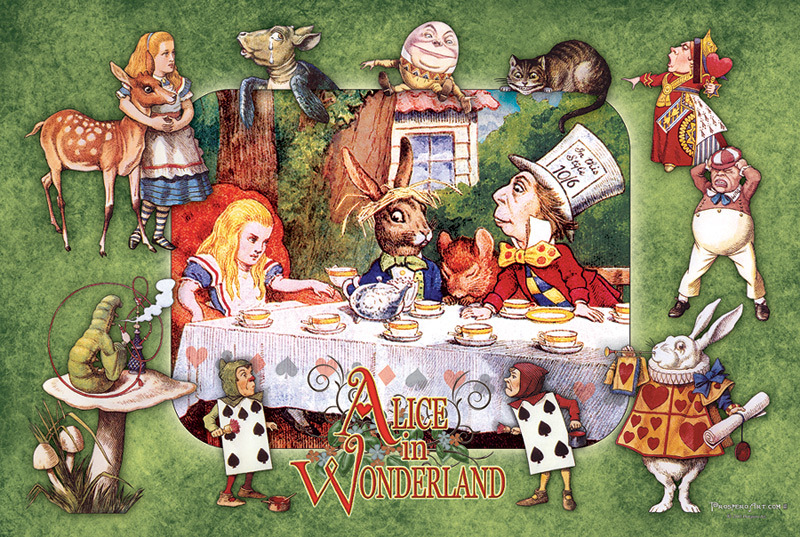 The folder was then put into a slip case decorated with a picture of Alice on the front and the Cheshire Cat on the back. All could be conveniently carried in a pocket or purse. When issued it also included a copy of Carroll’s pamphletted lecture, Eight or Nine Wise Words About Letter-Writing. Another invention is a writing tablet called the nyctograph for use at night that allowed for note-taking in the dark; thus eliminating the trouble of getting out of bed and striking a light when one wakes with an idea. The device consisted of a gridded card with sixteen squares and system of symbols representing an alphabet of Dodgson’s design, using letter shapes similar to the Graffiti writing system on a Palm device. Among the games he devised outside of logic there are a number of word games, including an early version of what today is known as Scrabble. He also appears to have invented, or at least certainly popularised, the “doublet” a form of brain-teaser that is still popular today: the game of changing one word into another by altering one letter at a time, each successive change always resulting in a genuine word. For instance, CAT is transformed into DOG by the following steps: CAT, COT, DOT, DOG Other items include a rule for finding the day of the week for any date; a means for justifying right margins on a typewriter; a steering device for a velociam (a type of tricycle); new systems of parliamentary representation;more nearly fair elimination rules for tennis tournaments; a new sort of postal money order; rules for reckoning postage; rules for a win in betting; rules for dividing a number by various divisors; a cardboard scale for the college common room he worked in later in life, which, held next to a glass, ensured the right amount of liqueur for the price paid; a double-sided adhesive strip for things like the fastening of envelopes or mounting things in books; a device for helping a bedridden invalid to read from a book placed sideways; and at least two ciphers for cryptography. French American Ornithologist, Naturalist, Hunter and painter John James Audubon (Jean-Jacques Audubon sadly passed away January 27, 1851. 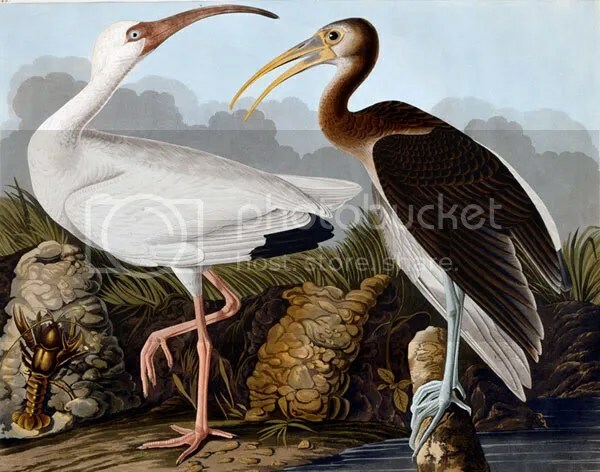 Born in Les Cayes in the French colony of Saint-Domingue (now Haiti) he is famous for having painted, catalogued, and described the birds of North America in a manner far superior to any before him. From his earliest days, Audubon had an affinity for birds and His father encouraged this interest in nature. Once in America Audubon went to a boarding house run by Quaker women. They taught him English, and He traveled with the family’s Quaker lawyer to the Audubon family farm in what he considered a paradise. “Hunting, fishing, drawing, and music occupied my every moment, Studying his surroundings, Audubon quickly learned the ornithologist’s rule, which he wrote, “The nature of the place—whether high or low, moist or dry, whether sloping north or south, or bearing tall trees or low shrubs—generally gives hint as to its inhabitants.”His father hoped that the lead mines on the property could be commercially developed, as lead was an essential component of bullets. This could provide his son with a profitable occupation. Audubon met his neighbor William Bakewell, the owner of the nearby estate, whose daughter Lucy he married five years later. The two young people shared many common interests, and early on began to spend time together, exploring the natural world around them. Audubon’s final work was on mammals, the Viviparous Quadrupeds of North America, prepared in collaboration with his good friend Rev. John Bachman of Charleston, South Carolina. Bachman supplied much of the scientific text. The work was completed by Audubon’s sons and son-in-law and published posthumously. His son John did most of the drawings. Audubon’s influence on ornithology and natural history was far reaching. Nearly all later ornithological works were inspired by his artistry and high standards. Charles Darwin quoted Audubon three times in On the Origin of Species and also in later works. Audubon’s field notes were a significant contribution to the understanding of bird anatomy and behavior. Birds of America is still considered one of the greatest examples of book art. Audubon discovered 25 new species and 12 new subspecies. He was elected to the Royal Society of Edinburgh, the Linnaean Society, and the Royal Society in recognition of his extraordinary contributions to Natural history.